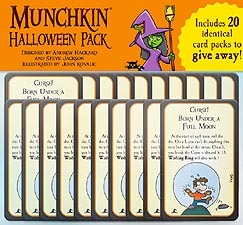 Rather than rot the teeth of your trick-or-treaters this year, why not rot their minds with a Munchkin Halloween Pack? Each of the twenty packs contains four new Munchkin cards and a tiny serving of information about Munchkin. And no one has to have a bellyache in the morning! Includes 20 identical card packs to give away!